When you visit Alpena, one thing is sure to happen, you’ll leave with some great stories of your adventures! Alpena is a nature-based community and as such, offers many experiences that get you out and about in the fresh air and sunshine. When you are done adventuring on the water and over the trails, you will find more than 80 dining options to meet your needs; from ice cream and wine tasting, to waterfront and outdoor dining. Live music, live theater, downtown street performers, concerts and movies in the park, and local events and traditions round out the perfect visit to the Alpena area. 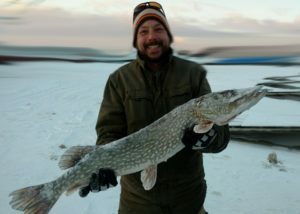 Josh Morasky holds a great pike catch while ice fishing in Alpena. Photo courtesy, Jessie Morasky. Whether you’re taking the kids out to create some relaxing memories or on the hunt for the next trophy catch, Northeast Michigan is THE destination for sport and recreational fishing. There are more than 300,000 acres of open water in the 4-county Northeast Michigan area and 100 separate accessible bodies of water. Locations for trolling, fishing off the river bank, fly fishing, fishing from a dock or canoe, a perfect reed bed for your bass boat, and even deep water options abound in an around Alpena. And when the lakes freeze over, we ice fish! Bring your own boat or book a charter to experience Alpena’s healthy fisheries. Get started by visiting our Fishing page! Alpena is home to the nation’s only freshwater marine sanctuary. Russ Green snorkels the Albany shipwreck found in 4-5 feet of water, just north of Alpena. Photo courtesy David Ruck, office of National Marine Sanctuaries. Thunder Bay National Marine Sanctuary protects about 200 historically significant shipwrecks that lay at rest on the bottom of Lake Huron. View the collection of shipwrecks in what is known as Shipwreck Ally via kayak or aboard Alpena’s glass-bottom boat, Lady Michigan. Visitors are also welcome to snorkel and dive the wrecks to get up close and personal with remnants of our nation’s past. Get your Shallow Shipwrecks Adventure Guide and start exploring! With light pollution readings among the lowest in the Great Lakes region, Alpena is a prime location for viewing the cosmos. Alpena is centrally located to 3 of the State’s newest Dark Sky Preserve parks. See the constellations of the northern hemisphere like you’ve never seen them before. If you’re lucky you may even be witness to a spectacular show of the Arora Borealis (Northern Lights). 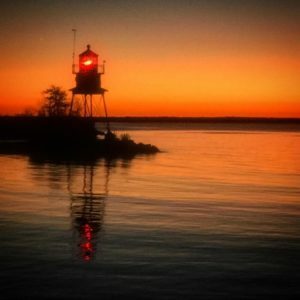 While stars are visible from the middle of the city, stargazing is best at one of Alpena’s nearby State parks including Rockport State Park Recreation Area, Thompson’s Harbor State Park, or Negwegon State Park. Additionally, these parks are recognized as Dark Sky Preserves, proof that what you’ll see is spectacular! Get your Dark Sky Adventure Guide and start stargazing! 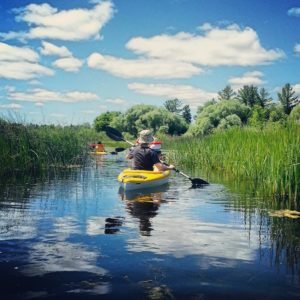 A serene kayak through the Alpena Wildlife Sanctuary. Being 66% water and boasting over 1,000 miles of shoreline, the Alpena area is a destination for water trail enthusiasts. Quiet rivers and lakes provide a serene setting for an afternoon of gliding on the water, wildlife watching, or daydreaming. Kayak and canoe or stand up paddleboard a variety of settings across the region on your own or ask for a special guided trip. Start paddling with the Paddle Kayak Canoe SUP Safety Guide! Everyone from road cyclists, trail bikers, and afternoon cruisers will enjoy adventuring through the area’s 100 miles of groomed trails on their favorite two-wheeler of choice. Recreational trails offer rugged terrain for beginner to advanced mountain bike riders. Winding country roads provide smooth surfaces for road cyclists. And, Alpena’s 18 ½ mile Bi-Path takes pleasure bikers on a tranquil loop throughout the city. Check out all the Trails to pick your favorite! The Great Lakes are a gift from prehistoric glacier movement and treasures have been left behind along the shores of Lake Huron and the many inland lakes and rivers. Hunt for fossils dating back 400 million years to the Devonian Period. Rockport State Recreation Area Adventure Guide includes an abandoned limestone quarry where visitors are allowed to take up to 25 pounds of fossils home with them per year! Learn more about Devonian Period fossils on our Fossils page. Alpena’s Little Red Lighthouse, located at the mouth of the Alpena Municipal Harbor. Northeast Michigan is home to seven spectacular lighthouses that helped guide ships to safe harbor in the early days of our nation’s formation. Included among the collection are the tallest accessible lighthouse on the Great Lakes and the oldest accessible lighthouse on the Great Lakes. Have you heard of the Haunted Light? Visit the Old Presque Isle Lighthouse and see if you become a believer! Most lighthouses are open mid-May through mid-October. Get your Lighthouse Adventure Guide to plan your route! Alpena is unique in that no matter where you are you are never far from a park or a beach; perfect spots for the whole family to relax and unwind. Escaping the stress of life is easy in this region embraced by clear blue water and lush green forests. Check them all out on our Trails, Parks, & Beaches page! 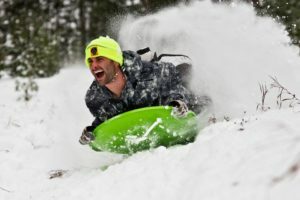 Adam Zeeman has a blast sledding in fresh snow. Photo courtesy, Paul Gerow. Michigan is draped in beauty when the winter months come calling. Alpena is a popular location for winter sports such as snowshoeing, ice skating, cross-country skiing, ice fishing, and snowmobiling. More than 100 miles of groomed trails and more than 13,000 acres of State managed forest land offer peace and tranquility for those who love to bundle up and head out into the refreshing outdoors. See what winter fun is in store for you on our Winter Fun page! The carefree days of your youth are alive and well in Alpena. Catching fireflies on warm summer evenings, searching for minnows with a net, reading a book under a shade tree, and watching the sunset while crickets provide background music are nostalgic experiences that we often wish we could relive. Alpena is that place where summer memories come alive as an everyday way of life and stress floats away with the river current. Visit a downtown coffee shop to catch up on email or disconnect to reconnect in the Sanctuary of the Great Lakes. Check out this video to see why so many people lovingly refer to Alpena as “My Sanctuary“.